This is a sponsored post written by me on behalf of CORT for SponsoredTweets. All opinions are 100% mine. Growing up I always thought that by the time I was 21 I would have been married with kids and own a home. Yes, 21 I said it. How crazy! Turns out I wanted to be a nomad, single and free. However, I never got that the proper advice on how to go about life and what to do while being a nomad. Let’s just say I thought I knew what I was doing but as it turns out I ended up spending a bunch of money on furniture. I had to move 5 times in two years and some of those moves were out of state. It became really difficult. How can I haul all this furniture across the country, without selling my soul? Honestly, it was just depressing I felt like I was actually carrying the physical weight on my shoulder when it came to relocating. Long story short I ended up putting half of my stuff in storage and getting rid of the other half. Bummer! Waste of hard-working money. 1. Look into alternate options other than buying furniture. If you’re a nomad like me you won’t want furniture slowing you down by having all that load cost time and money. You want to be able to go whenever you are ready without added stress. 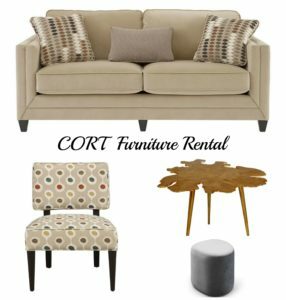 CORT Furniture Rental is a great option for furniture on-demand. If you wish to move to another state or travel you can opt into a shorter lease. Oh! did I forget to mention that Rent Furniture will send their movers to take back the furniture for you? Well, yes you just can’t go wrong. There when you need it, gone when you no longer need it. Hassle free, It’s that simple and convenient. 2. Practice minimalism and reduce as much junk as possible and try not to buy more than what you need. Purge all unnecessary clutter, this makes moving fast and efficient. This way you will have space for a new decor and save a little extra. 3. Ensure to use boxes and containers to store your items properly and securely. 4. Create a packing to-do list. Your move can’t be organized and complete without a packing/to-do list. Get it together millennials!!! 5. Change your address in advance of your move. If you’re like me, you probably would want to use your parent’s address as your default address for very critical things. You don’t want your important documents to be circulating out there. 1. Organizing is important, using storage containers/bins will keep things organize especially if you have a smaller space and still looking cute at the same time. 2. Get creative with DIY projects. 3. Don’t get stuck on a theme, rather find a signature style and go with it. Select pieces that represent you and that will complement the wall and flooring of your space. Luckily you can get furniture, home accessories and other household items at CORT. EVERYTHING YOU NEED! 4. Avoid commitment by choosing to rent furniture, again CORT Furniture and Rental offers everything you need. Also, use removable wallpaper, reversible linens and inexpensive decor that you can re-purpose into something new. 5. Give your furniture breathing space, avoid overcrowding. That’s just a ‘hot mess’ it’s tacky. Spend your money on fewer but better quality pieces of furniture. Go to CORT website or follow them on Instagram to get fabulous ideas for your next move.